Distance from carpark: 33 km. 13. 31/5/2017. Trampers. Ardachys – Blacksmith Flat. M. Leader: Arthur. The weather wasn’t great, but good enough. 8 trampers out today, including one new member – welcome Phil. We travelled in low cloud all the way from Outram to our parking spot at Ardachy, but from there on we could clearly see down into the Taieri gorge. An improvement was expected though. 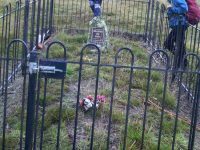 We first went to inspect the nearby “Lonely Grave” of Mr Don Graham. A short stop was made in the tussock for morning tea, before continuing on down hill. 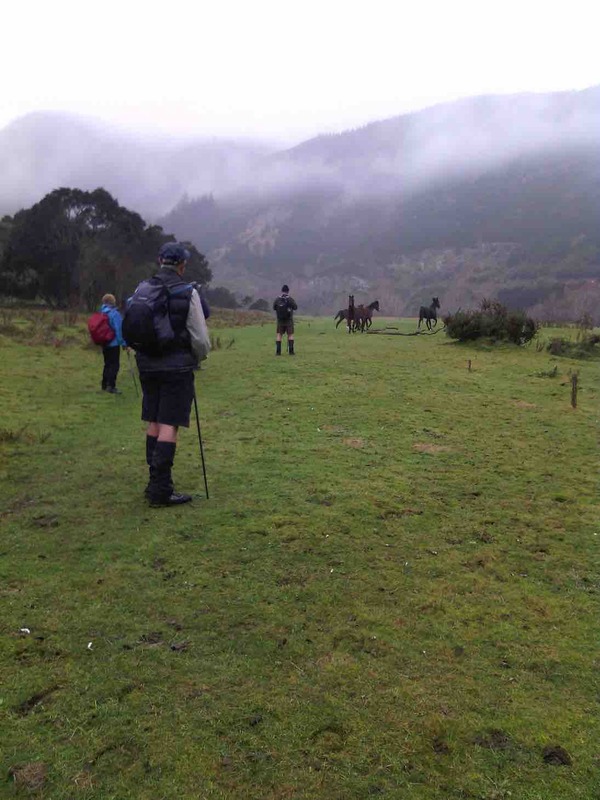 4 friendly horses greeted us when we reached “Blacksmith Flat”, beside the Taieri river. We followed the “Flat” upstream for some distance, before turning and retracing our steps. Mount Allan railway station was directly across the river from us, but no train today. It was a lovely and peaceful spot there, the river making the only noise, except for 6-8 fantails flitting around. 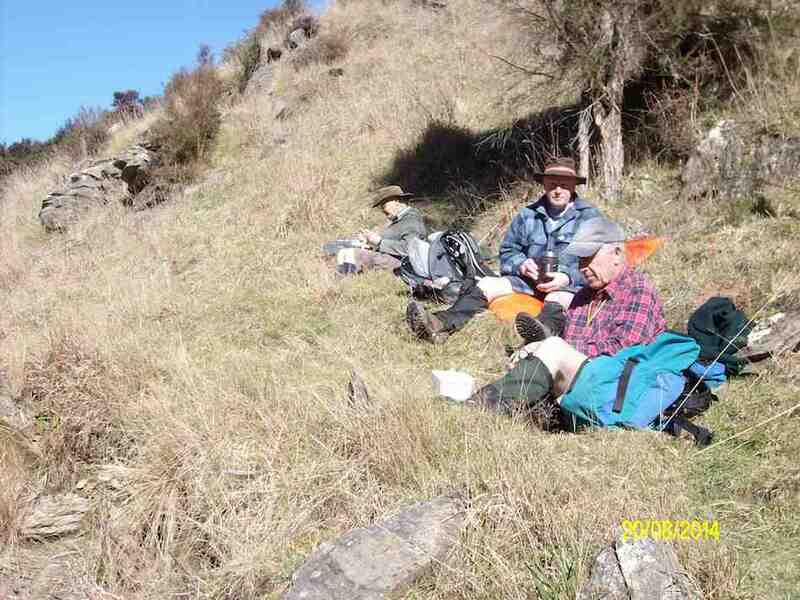 The return journey was up “Blacksmith Gully”, and we travelled some distance before stopping for lunch. 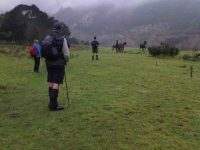 The cloud had come down now, with no more than a couple of hundred metres visibility, and remained so until we returned to Outram. Incidentally, the names “Blacksmith Flat” and “Blacksmith Gully” go back to the gold mining era around 1863. Gold was found in some quantity in the area, but after 2 0r 3 years the “rush” was over. 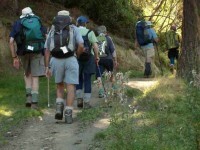 The leader decided that, as it was a relatively short tramp today, we would return by a slightly more strenuous route than had been planned originally, to give everyone a bit of a workout. All thought this a great idea, and enjoyed the extra bit. There were no complaints anyway! 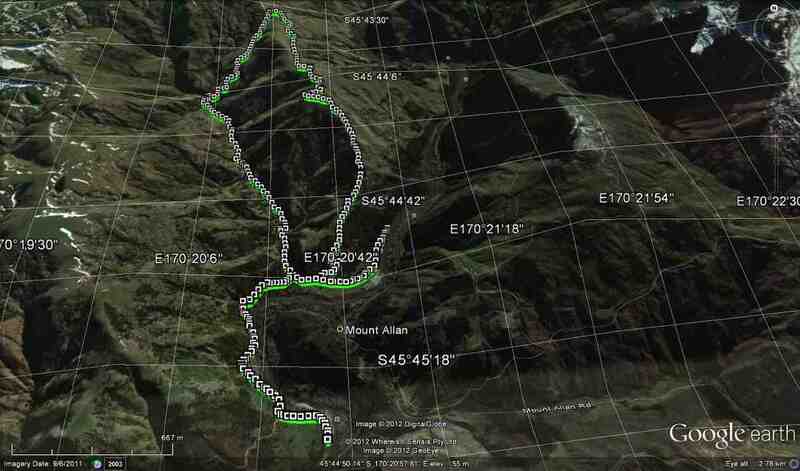 We arrived back at the cars before 1.30 pm, having walked 8.8 km. The vertical difference in altitude between the river and the cars was approx. 250 metres. On returning to Mosgiel we stopped in at Wals for hot drinks, sitting in front of the fire to enjoy them. It made a very good end to the day. – Art. 12. 20/8/2014. Trampers. Ardachy Station. Blacksmith Flat and Gully. Medium. 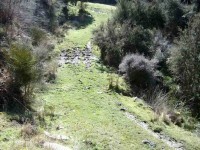 … not far from where we had to cross the stream, & start the climb back to the car. After a leisurely lunch, we moved on until we came to the old mine shaft, which we climbed up the bank to inspect. the fence around it is slowly getting wrecked as time goes on, but the bush growing around the hole is still protecting it well. After this, it was just a matter of climbing back to the car, which seems like a daunting task when looking up from the valley floor, but it only takes around 1/2 an hour to climb out. 11. 8/8/2012. Trampers. Ardachy Station. Blacksmith Flat and Gully. Medium. 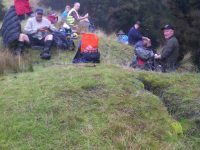 The pic below shows 3/4 of the party at the point on the ridge where on previous tramps we had crossed from the river side of the ridge to the other. We arrived at this point by keeping to the ridge and avoiding the river-side track. Here we stopped for morning tea. There had been a little drizzle to this point, but from here on, the weather and the views cleared to give us a good day out. To those who remained at home, we proved that you make your own luck. Bravo. The cross-over point on the ridge taken on previous tramps. And from this point we still kept to the ridge and found a clear crack down the nose of the ridge to the river flats. Club pioneers! I think we’ll always wish to do the descent this way, now. 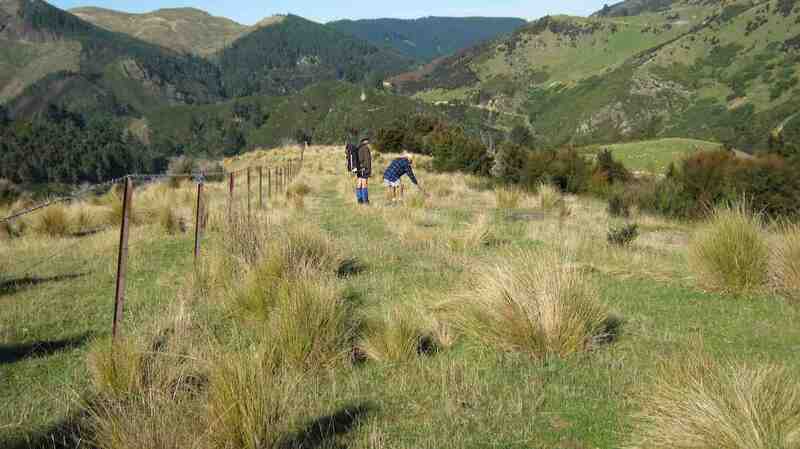 We explored Blacksmith flat, noting a new electric fence put in no doubt to keep stock away from the river. 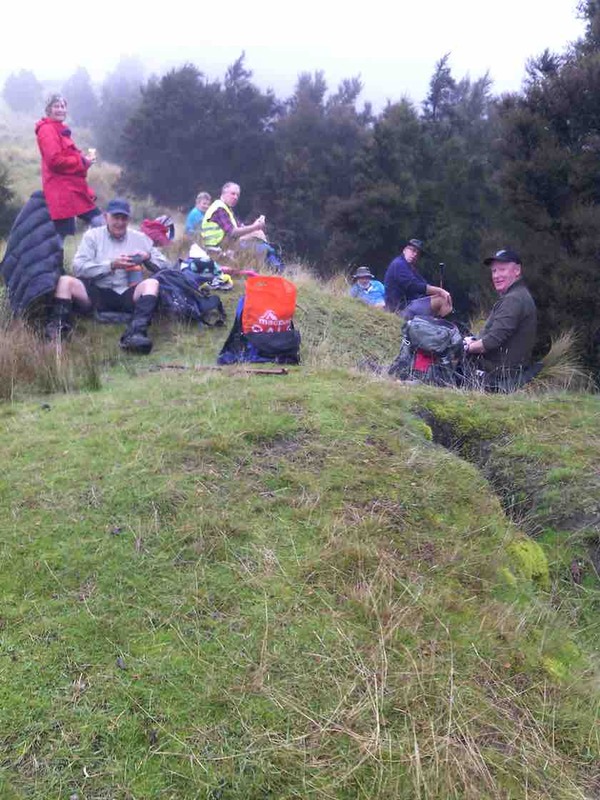 We then took the track down-river that leads to the further flat reached from the Mains Road tramp, and lunched, seated at the lovely BBQ area. 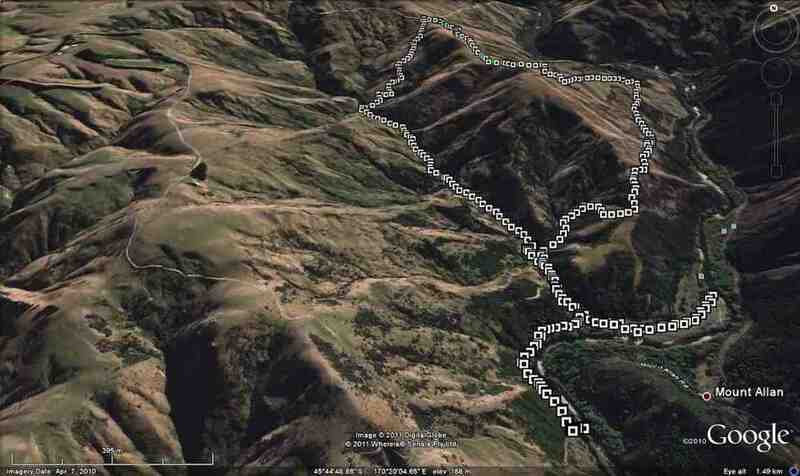 Then it was back to take the Blacksmith Gully route up to the car. The writer had forgotten just how far we have to ascend the gully floor before locating the FWD track that takes us back up to the car. Then it was just a 25-minute hard-breathing one-foot-in-front-of-the-other climb, after first subjecting Judy to the obligatory mine shaft sighting. And so back into the car and out along a road, good and smooth, but a bit sloppy from the earlier drizzle. A good try-out for Ian’s little new/old Corolla. – Ian. 10. 30/3/2011. Trampers. Ardachy Station. 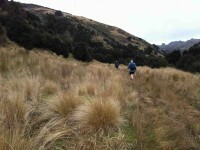 Blacksmith Gully. Medium. 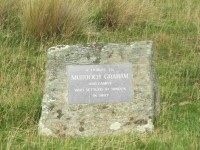 We passed by the gravesite dedicated to Murdoch Graham and went onto the FWD track ahead. 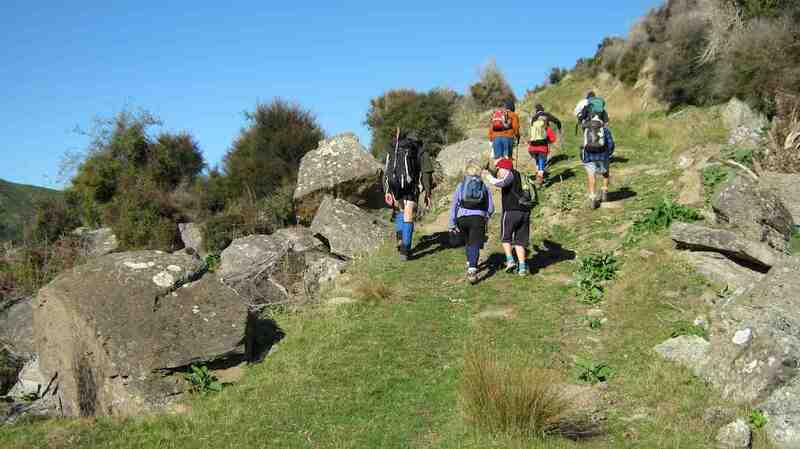 This gradually descended before eventually climbing again to cross the steadily descending ridge on our right. At this point, through a gate in the fence on the ridge crest, we took a track descending on the ridge’s right, although the Google Earth map does show a track going on down the ridge to the bottom. 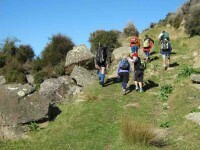 The track to the right led us down into Blacksmith Gully which we pursued down to its end on the Taieri River. 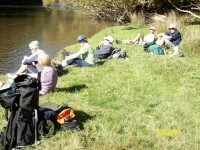 After a wander round, we took the track going on down the river to lunch in warm sun by the water on a grassy flat. 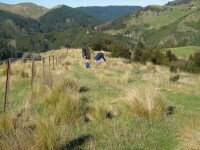 this time we went further up Blacksmith Gully till we took a track that at its first zigzag encompassed the fenced off mine shaft and threw down stones to gauge its depth. Then it was steadily on up up up to regain the cars at the track’s top. – Ian. Daphne, then President and founding member of the Club, was also a member of the Dunedin Photographic Club. She met Don Graham, Ardachy Station owner there and got talking. An upshot was that he invited the Club to do a tramp on his land. This the Club did in 1989. They parked where we still park today, and followed the ridge from there down to the Flats. 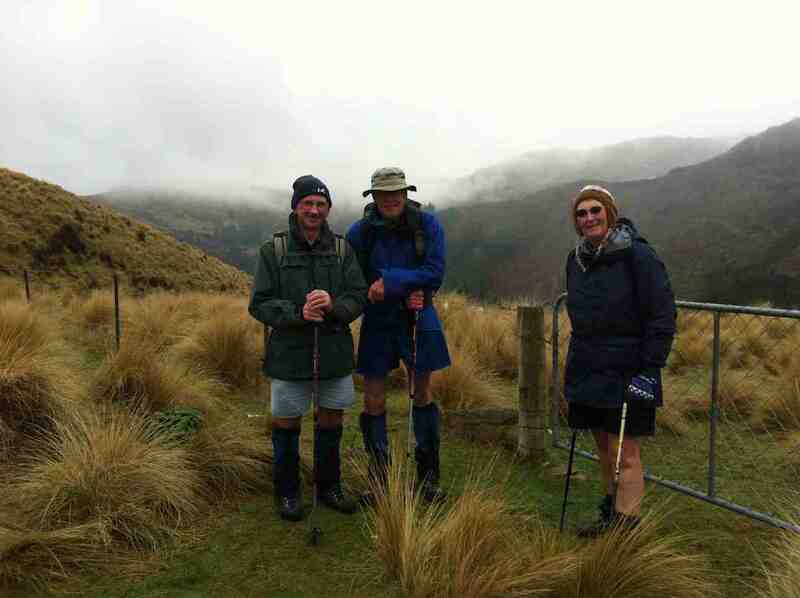 An arduous effort, following the ridges ups and downs. (We follow an easier 4WD track today.) On their return, club members were surprised to find Don by the cars, with a billy boiling over a fire. He invited them to get their mugs out and filled them with tea. A very happy introduction to what has been a satisfying series of tramps there over the years. Post-post-script: – from NZ Herald Sunday April 3 2011. 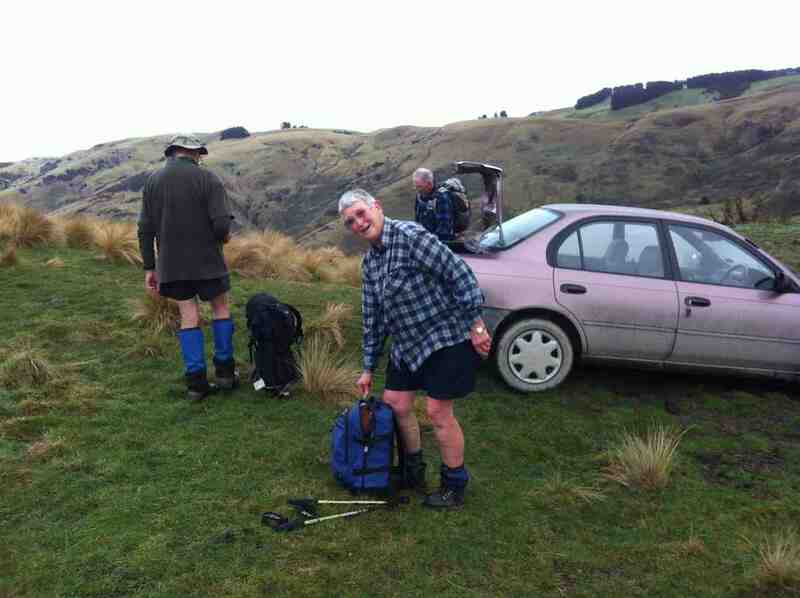 It took a long battle with bureaucracy, but an Otago farmer has been returned to the soil he worked on all his life. Don Graham, 72, was buried on his Ardachy Station property at Hindon this week in a ceremony attended by more than 120 family members and friends. 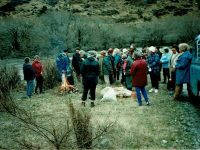 A bagpiper played as Mr Graham was interred in the place he had chosen on the property, among rolling hills and wind-swept tussock. 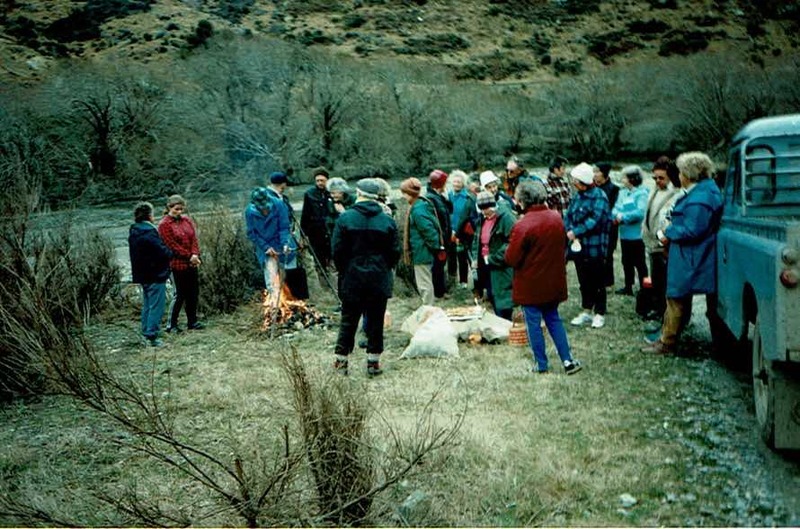 Obtaining permission for the burial was a long legal process, including gathering affidavits and securing consents. Funeral director Robert Campbell said it was the first time in 40 years he had been involved in a home burial. “It’s very uncommon, because you have to get permission through the Burial in a Special Place Act,” he said. The law stipulates that people must be buried communally if they lived within 32km of a cemetery. 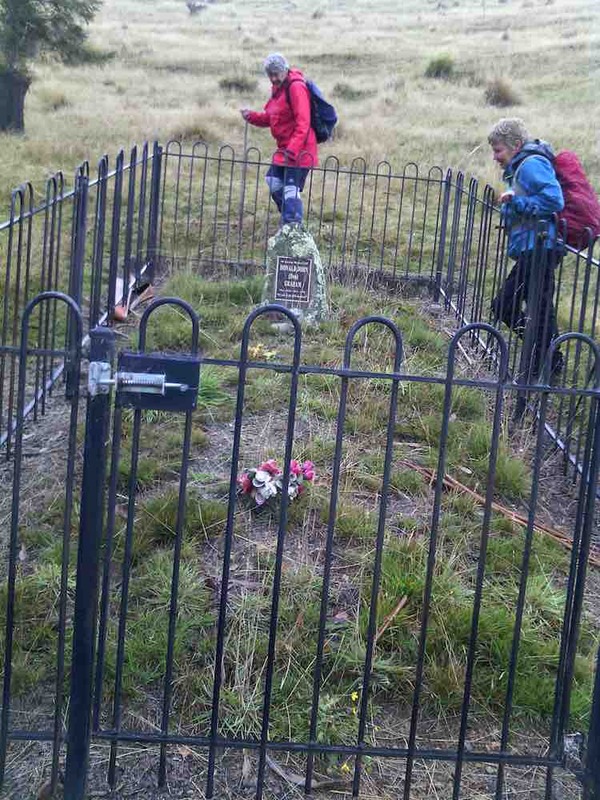 The grave site looks over Ardachy Station towards the Taieri River. “It’s a lovely spot in the hills overlooking the valley,” said Robin Gamble, who delivered the eulogy at the funeral. Mr Gamble said Mr Graham was passionate about the area in which he lived, and always wanted to be buried there. 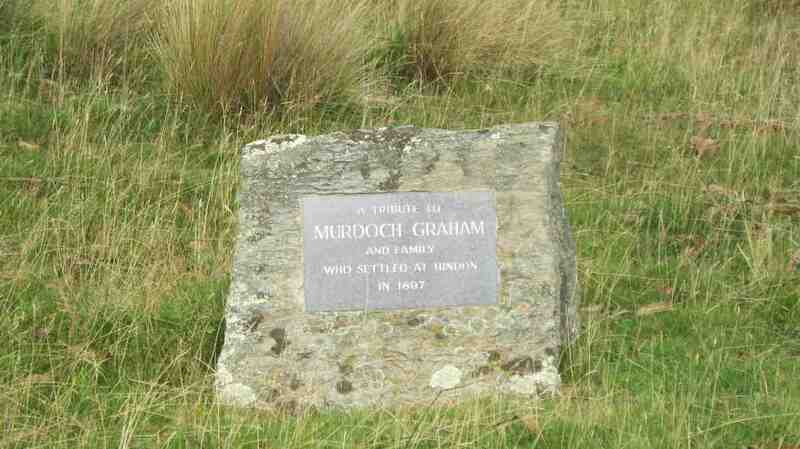 Mr Graham lived all his life in the area, taking over Ardachy Station from his father-in-law in 1956. Mr Graham’s widow, Leila, said it was an emotional day for her and her two sons. “He spent very little time away from the farm, and he would have been so proud. We can look out the back window of the house and see him down there now,” she said. Mr Graham enjoyed a laugh. On April 1, 1991, he appeared on the front page of the Otago Daily Times with a “shabbit”, a creature he claimed to have bred from a merino sheep and a rabbit. The April Fool’s Day trick was so successful people were still ringing him up months later to ask about breeding stock. Very good but long drive in.. Several fences and gates to negotiate. Took Hindon turn-off from George King Memorial Drive. 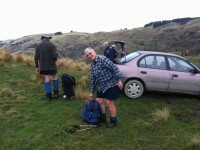 Just before road dipped down to the Taieri Park, parked at corner on grassy surface off road. Followed 4WD down to river. Proceeded down-stream for some distance and stopped for lunch. Returned clockwise up valley. At stone fireplace, turned steeply up right bank, viewed vertical mine shaft, and met 4WD track back up to cars. 8. 18/4/2001. Hindon, Ardachy Station, Blacksmith Gully. Leaders: Bob H, Colleen, Doug M.
6. 27/11/1996. Blacksmiths Gully Hindon. Leaders: Eric and Dot, Joan H.
4. 25/10/1995. Hindon, Blacksmith Gully, (Old Battery). Medium+. Leaders: George, Ria L, Bob Q, Jack R.
3. 3/11/1993. 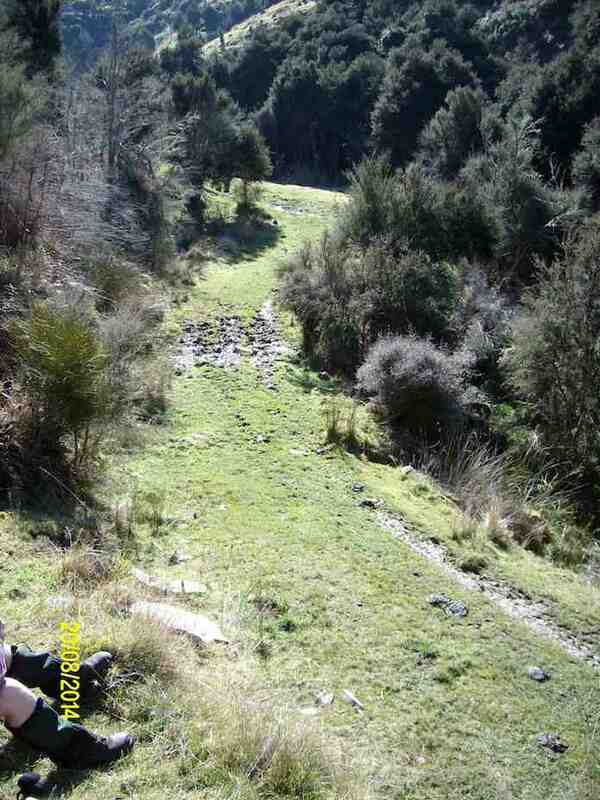 Blacksmith Gully. Hindon. Medium. Leaders: Bob, Daphne, Margaret D, Bob Q. Easier alternative:: Leaders: Les and Mavis. 2. 19/6/1991. Blacksmith’s Gully. Lovely views – a good climb home. Average+. Leaders: Mervyn, Wendy, Ted, Daphne. 1. 22/3/1989. Blacksmith’s Gully from Ardachy Station. 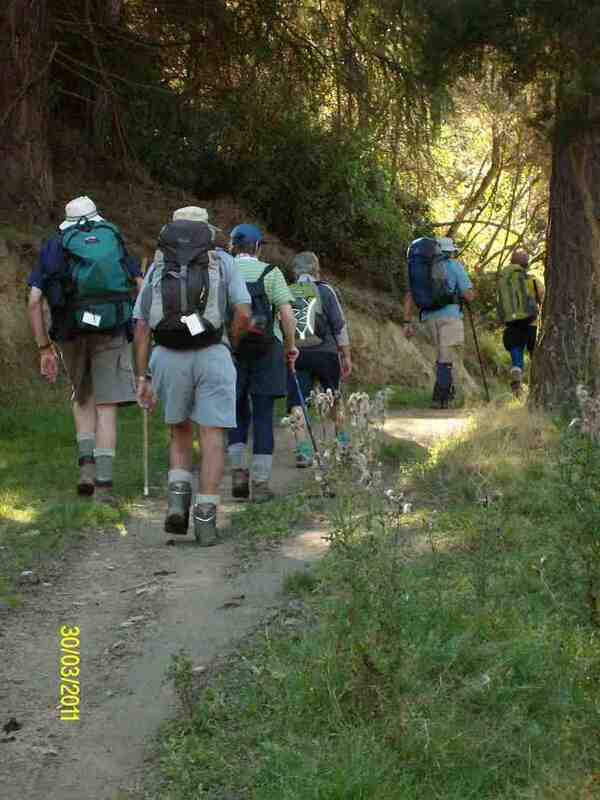 Lovely walk to Taieri River. Steep return. Leaders: Kath, Jack and Joan. very nice to see such a nice write up about my pop, it was very special. Thanks for your comment, Sarah. You make the connection with Ardachy even more special for us.